The Yorkie was originally part of the Terrier group as they were larger and used in mines to hunt out rats. Over the years they have been breed to be smaller and are now part of the Toy group. 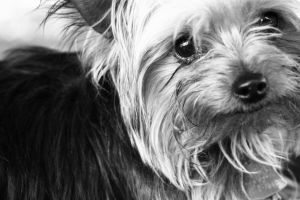 The Yorkshire Terrier is one of the most popular breeds of dog in North America. They are so popular that they are seen with celebrities like Britney Spears and Paris Hilton who have been known to carrier their pet dogs with them. These Yorkshire Terriers were all dressed up of course. They are popular due to their small size (3- 7 pounds!) attractive looks and attitude. But they still have the feisty terrier attitude. It is a very loyal dog that will protect its family with a warning bark. It’s loyalty shows in its desire to please its owners. A Yorkie’s are always alert and holds their heads high. They have glossy coats, fine and long hair. And they have no undercoat – which means it doesn’t shed much. Their hair is like human hair which falls out rarely and grows long until cut. They also carry less dander and therefore do not carry as much of an odor when wet and are better for people with allergies. A Yorkshire will live for about 12-15 years. The smallest ones may live a shorter life span though. They have sensitive digestive system so be sure to stick to a regular diet and avoid too many treats or table scraps. They also are known to have sensitive skin and are prone to allergies.